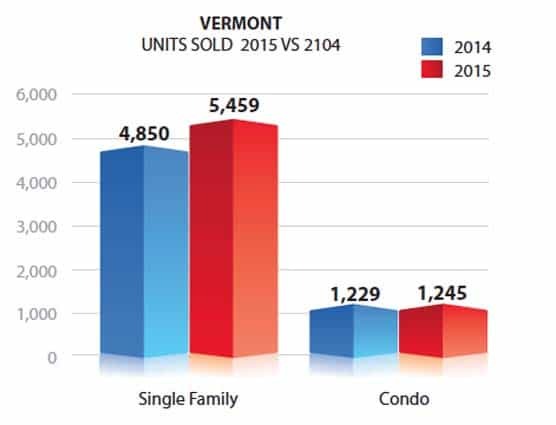 Vermont single family homes and condo sales show an increase in 2015 compared to 2014. An affordable housing market in Vermont led to an increase in sales in 2015. According to Northern New England Real Estate Network (NNEREN) data, single-family home sales increased 12.6 percent year-over-year, while condominium sales experienced modest gains, increasing by 1.3 percent. Median sale prices for single-family homes remained the same at $205,000, and total volume increased by 10.5 percent. Single-family homes stayed on the market for an average of four fewer days in 2015, while condominiums were sold in ten fewer days on average. According to the Vermont Realtor’s Association, 89 percent of homes were sold for their asking price in 2015. Ingalls said his office was up 10-20 percent in 2015, outperforming the statewide market. “This year we were a little low in the medium range price points ($200,000-$350,000), which helped fuel a stronger market,” said Rich Gardner, broker/owner of RE/MAX North Professionals in Colchester. “There was healthy competition in the market. It made pricing homes a bit easier, and in some cases homes were able to be priced a bit higher than the market research,” Gardner said. Homes prices higher than that range proved to be a little more difficult to sell. “If you sell above $400,000 people will call and congratulate you,” Ingalls said. Gardner, whose office covers Chittenden County, which includes the state’s largest city of Burlington, faces the unique challenge of battling against the rental market. “Millennials are weighing their options here, and livability is big. They can get a brand new rental with all the bells and whistles for the about the same price to buy a home.” Gardner said. He went on to say that most of the new developments in his area are residential condominium developments, and not the typical single-family home developments.